we provide custom window bars which not only makes your window more stylish but also keep your home safe and secure,we have a wide range of custom windows which will meet your requirement. Manufacturers of "EZ Escape" The quick release fire safe window guard that meets or exceeds the US consumer products and safety commission standards. Including the requirement that all window guards have a quick release system that can be accessed from the interior of a home without the use of a padlock, key or tool. Our customers all have common concerns when it comes to wrought iron window guards Also called Burglar bars. They don't want their home to look like a prison and they don't want the possibility of being trapped inside in case of a fire. We have developed a window guard system that satisfies these requirements and looks like mosquito screen from the exterior. 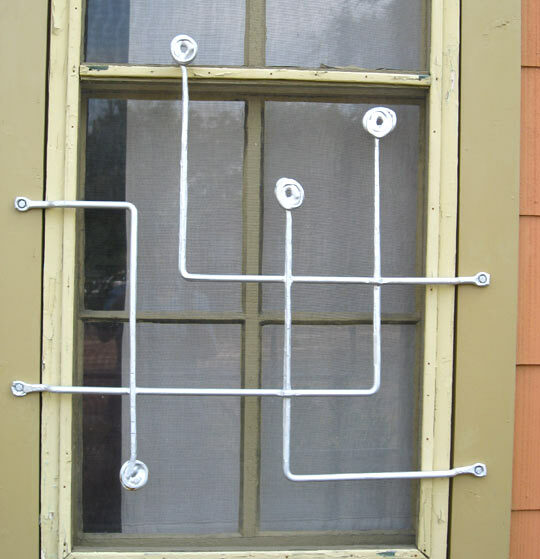 We can also make standard burglar bars with quick release mechanisms. For any questions or suggestions regarding the EZ escape window guards or standard window bars with a quick release please contact us. 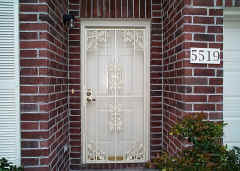 Drews Ironworks makes custom window grills to match the style, theme and era of your home. Sometimes called "Burglar Bars" grills can add to your families security and safety. Window guards by Drews can range from plain bars to elaborate metal art sculptured window protection. You can also submit your own design for fabrication. Emergency quick release latches are available for unlocking your window protection from inside your home or business. Since all guards are built custom for your home, price depends on the size and style being ordered. All feature solid steel construction and can mount in minutes by the home owner or handyperson. Contact us regarding measurements and provide your city/state or zip code to calculate shipping costs.